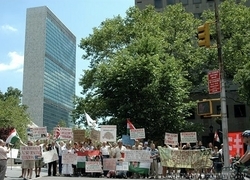 On June 6, 2010, at 12:30 pm Hungarian-Americans and their supporters will commemorate the 90th anniversary of the Treaty of Trianon, to be held in Dag Hammarskjold Square in front of the UN building in New York, NY. June fourth is a day of mourning for Hungarians all across the world. American-Hungarians will offer a symbolic gesture of solidarity to voice our concern of this ongoing and unfair neglect towards all ethnic Hungarians who still suffer discrimination. What a preposterous question! American citizens would justifiably never take that seriously. If a poll were taken to gauge the possibility of losing two-thirds of their country, most Americans would probably shrug it off as a bad and tasteless joke. Sadly, such an eerily similar irrational concept became a true nightmare for millions of Hungarian citizens after the tragic dictates of the Treaty of Trianon in 1920. Millions of Hungarians woke up on June 5, 1920 only to realize they were no longer a citizen of the country in which they were born. This nightmare became their reality. Imagine being forced to learn a language not native to your own culture without ever moving to a different country. Imagine being called homeless in your own home and nationless in a place your family had lived for over a thousand years. In the ashes of World War One, millions of Hungarian citizens woke up one day to discover that they had no ability to exercise their own right to self-determination. Just imagine the absurdity of this reality! Ninety years have passed since the Treaty of Trianon was signed. According to the research of the World Federation of Hungarians, during the subsequent decades following the Treaty of Trianon, hundreds of thousands of Hungarian families had been forcibly uprooted and countless lives had been destroyed. Decades before the atrocities committed during the Yugoslav Wars made the phrase ‘ethnic cleansing’ and cultural genocide infamous, thousands of indigenous ethnic Hungarian villages were destroyed without mercy including birth records, and tens of thousands of ethnic Hungarians were killed for the crime of simply existing. Over the past ninety years regional regimes of many colors and ideologies rose and fell and, regardless of the respective dictator’s name, Hungarians continued to suffer discrimination and shame. After the fall of Communism in 1989 there was a moment of hope that would end this nightmare. Millions of Hungarians took a deep breath hoping for the miracle of peace and self-determination. The past twenty years was supposed to offer a new opportunity to review all injustices including those committed against ethnic Hungarians in a democratic and open manner. In spite of several inadequate attempts to quell anti-Hungarian sentiment, the anticipated miracle never happened. Many would ask how something which occurred so long ago could still have relevance today. In the 21st century Hungarians continue to suffer discrimination at the hands of chauvinistic politicians and callous racists. The Slovakian government officially fines ethnic Hungarians for using their native language and stripping them of their citizenship. Serbians repeatedly beat and harass Hungarians because of their ethnic identity, and Romania is incapable of recognizing the cultural autonomy of over 1.5 million Hungarians living in Transylvania. This ongoing nightmare has not ended and the absurdity has not changed. The World Federation of Hungarian's research indicates that The European Union (EU) was supposed to offer tools to help solve these conflicts. It was assumed that membership in the EU would offer all nationalities a sense of harmony and peace under the protection and security of a united continent, yet countless atrocities towards ethnic Hungarians are systematically ignored. The EU continually refuses to openly acknowledge discrimination toward Hungarians and silently accepts racist political ideologies like the Benes Decrees, which was directly responsible for the forced migrations and mass slaughter of hundreds of thousands of ethnic Hungarians and Germans alike. Cultural and even political autonomy is the norm in Western Europe, but for some strange reason this right does not seem to apply to Hungarian minorities living within the Carpathian Basin. The fourth of June is a day of mourning for Hungarians all across the world. To commemorate this event, American-Hungarians will offer a symbolic gesture of solidarity to voice our concern of this ongoing and unfair neglect towards all ethnic Hungarians who still suffer discrimination.